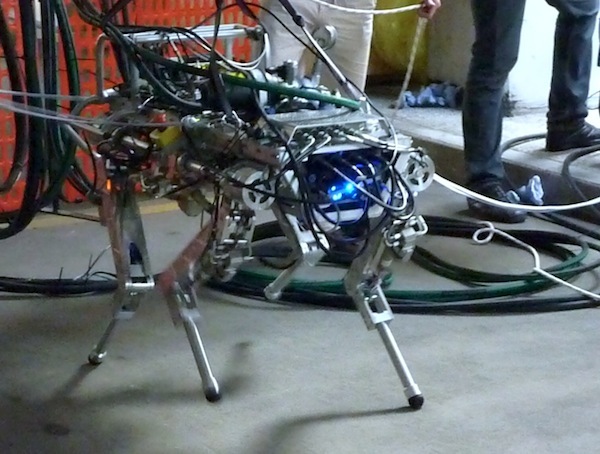 Researchers from the Italian Institute of Technology took their quadruped robot HyQ for a test run outside the lab for the first time to test new tricks HyQ has learned, including the ability to trot over obstacles without falling, IEET Spectrum Automaton reports. The robot is still a strange headless creature, and though a sensor head is in the works, this quadruped might get even weirder with a new hardware addition: arms. The goal: an autonomous, versatile machine capable of running, jumping, and negotiating rough terrain that could find applications in search-and-rescue operations and exploratory missions.